What Kind of Falcons Do We Fly? 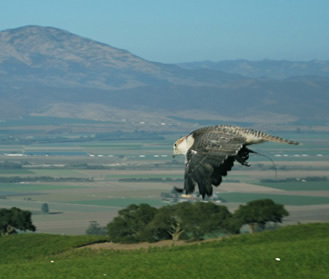 TAP primarily flies Saker falcons for their ability to with stand warmer climates, Barbary falcons for hazing a smaller pest species and Peregrine falcons for their love of flying. Do TAP’s Falcons Kill Pest Birds? We adhere to a no-kill policy. On the rare occasion that one of the patrolling falcons captures a pest bird, every effort is taken to spare the life of the pest bird and release it. If this is not practical, the falcon is taken to a private area where the falcon is traded for quail meat. The falcons are fed the same high quality quail that is raised for human consumption. 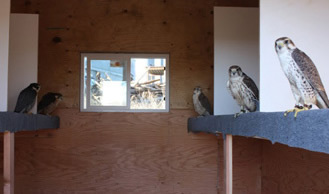 How Are TAP's Falcons Trained for Bird Abatement? When our falcon chases a pigeon or other type of pest bird, it gets rewarded by being called to a lure. To a falcon the lure works like playing fetch for a dog. Correct behavior (like chasing pest birds) is rewarded by using the lure. Emotional rewards like praise, negative reinforcement or punishment does not work when training hawks and falcons. Can TAP’s Falcons Fly Away? Yes. All our falcons are fully flighted and have the ability to fly off at any time while doing abatement - the falcon chooses to come back when it leaves the fist. We provide the falcons with quality food, medical care, a warm home and safety. 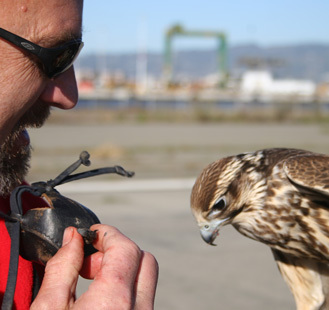 Good falconers are good at observing — very sensitive to everything the falcon does and needs. Training alone does not make a good falconer. Falconers need to have a certain something that allows them to understand and react to the bird's smallest needs. Is It Necessary to Hood the Falcons? Yes, occasionally. Since falcons have tremendous eye sight, visual distractions are difficult and potentially dangerous to un-hooded falcons. Hoods are used to keep them calm before work, after work and during transit. Falconry hoods are a work of art and are designed to fit each birds head and eyes perfectly so as not to damage or irritate.